Assorted fresh fruit, such as sliced peaches, straw-berries, blueberries, bananas, kiwis, etc. Cut cookie dough into 1/8th inch slices. Line a 14 inch pizza pan sprayed with pam with cookie slices overlapping slightly. Bake at 375 degrees for 12 minutes; cool. Combine cream cheese, sugar, and vanilla mixing until well blended. Spread mixture over cookie crust. Arrange prepared fruit over cream cheese layer. Combine Warm and Fuzzy preserves with orange juice; brush liberally over fruit. This will give pizza a beautiful glossy appearance, not to mention a fabulous flavor. 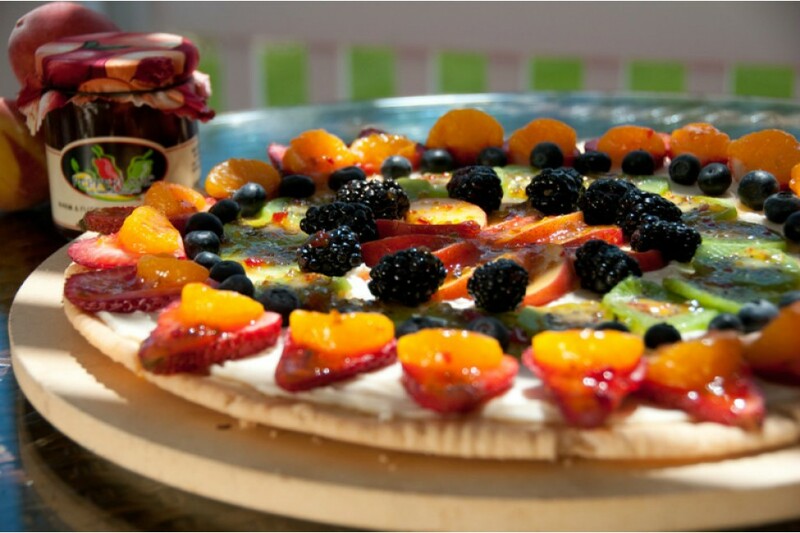 Chill pizza in refrigerator for 30 minutes or up to 2 hours (to help set the pre-serves).